Winco is the grocery store we would ALWAYS go to in Boise! 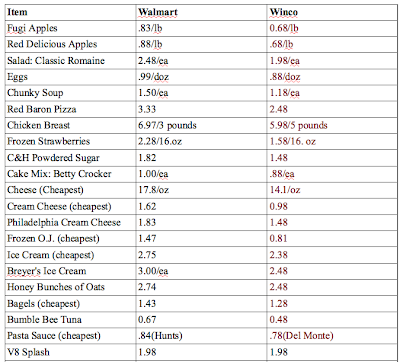 Everyone knew it was the cheapest, so I decided to do a little sample comparison of prices between the two on food. Anyways, Winco is AWESOME! If anything, you should at least go and check it out. I'm sure you'll be happy with what you find. They have bulk items too, and lots of em'! So you can get cereal, candy, spices, dog food...anything in bulk pretty much! That's my favorite part! Ok, you have convinced me, I will shop at Winco. WOW!!! I should do my own price list comparison of my favorite items. That's awesome! Okay, so Quincy and I just walkedd in the door from our first WinCo shopping experience, and you are SO right! The produce is crazy cheap! We bought a ten pound bag of huge red apples for $1.98! Holy moly! Love it!